This section is from the book "Modern Buildings, Their Planning, Construction And Equipment Vol1", by G. A. T. Middleton. Also available from Amazon: Modern Buildings. The manner in which bricks are arranged in a wall is obviously of great importance to the appearance and strength thereof. Thus in Fig. 81, which represents an angle of a 14-inch brick wall, it is clear that if the foundations upon which it is built were to settle irregularly the wall would split from top to bottom along one or more of the continuous vertical joints ab, cd, etc., according to the nature of the settlement. In fact, the wall would act simply as a number of separate piers, with nothing to bind them together save the adhesion of the mortar. Now if a closer, or half-brick cut longitudinally, be inserted next to the smaller end of the corner brick and continued through the thickness of the wall in every course, as in Fig. 82, it will be seen that each brick overlaps the bricks with which it is in contact, thus entirely avoiding the continuous vertical joints referred to above. 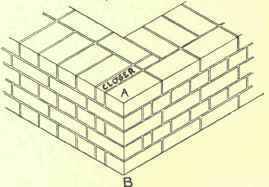 In building a brick structure, therefore, care should be taken to lay each brick so that it will overlap the bricks with which it is in contact above and below, in such a manner that the whole wall will act as a homogeneous mass. This process of overlapping is called "Bonding." The following are the principal forms of bonding: English, English Cross, Double Flemish, Single Flemish, Heading, Stretching, Raking, Garden Wall, Boundary Wall, Sussex, Scotch, and Dutch. 1. The bricks must be uniform in size. 2. The arrangement of the bricks should be uniform throughout the wall. 3. Bats, i.e. small portions of bricks, should be used as little as possible. 4. The bricks in the interiors of walls should be laid as headers, that is, across the wall, except in some special cases, such as footings, corbels, and cornices. 5. The lap should not be more than 2 1/4 inches. 6. The vertical joints in every other course should be vertically over one another, whether on the face or in the interior of a wall, or, as expressed in technical language, the prepends should be kept. The appearance of a wall in English bond is shown in Fig. 82. The facing bricks are laid in alternate courses of headers and stretchers, with queen-closers inserted next to the quoin-headers to cause the bricks to overlap properly. It will be found instructive to notice in Fig. 82 that it does not matter whether the line AB represents a stopped end, an external angle formed by the junction of two walls, or plain or rebated jambs to openings, the appearance of face is precisely the same in all cases. English bond is undoubtedly the strongest, as it almost entirely avoids continuous vertical joints (see Fig. 83, where the blackened joints are continuous), and this fact alone should commend it to general use; yet many object to its use on the ground that the numerous transverse joints permit the penetration of damp, and that its appearance is not as good as that of brickwork bonded in Flemish bond. These are false objections, however, as there is no more likelihood of damp penetrating a wall in English bond than any other bond, provided the bricks are thoroughly flushed up with mortar. Also if the appearance were objectionable, there is no reason whatever why strength should be sacrificed for so minor a consideration. It is not unusual to find a novice poring hopelessly over a set of plans of alternate courses of bricks in walls of various thicknesses, in the vain endeavour to remember each one as something separate and apart from every other. 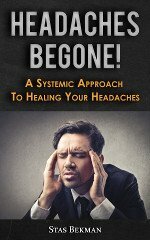 This is what he should most carefully avoid, and instead he should learn the few simple facts common to all walls bonded in any particular manner. The following rules should be observed in building walls in English bond. 1. There should always be a quoin-header (or, in other words, a header should come at the corner or quoin) in every other course. 2. There should always be a queen-closer next to the quoin-header, and this closer should be continued through the thickness of the wall. 3. 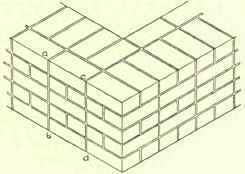 In walls of an even number of half-bricks in thickness (i.e. 9, 18, 27-inch, etc., walls) that course which shows headers on the face will also show headers on the back, while that course which shows stretchers on the face will show stretchers on the back. 4. In walls of an odd number of half-bricks in thickness (i.e. 14, 22 1/2-inch, etc., walls) that course which shows headers on the face will show stretchers on the back, while that course which shows stretchers on the face will show headers on the back. These rules are exemplified in Fig. 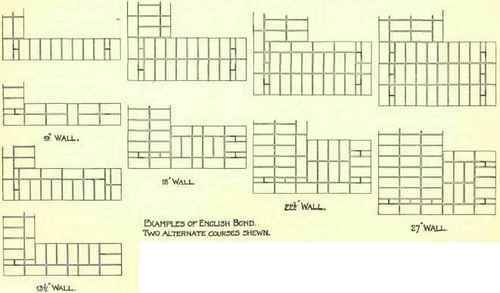 83, in which are shown two courses of each of the most generally used thicknesses of walling in English bond, with a stopped end and corner in each case. The above rules can be more readily remembered in a diagrammatic form. Thus Fig. 84 shows all the rules at a glance, and it can be committed to memory in a few minutes. This diagram enables anyone to bond plain walls, right-angle junctions of walls, whether of equal or unequal thickness, and stopped ends to walls. The application of the diagram is best illustrated by means of an example. Suppose we have a wall 27 inches thick meeting a wall 18 inches thick at right angles, the external faces of the walls being 3 ft. 11 in. and 4 ft. 6 in. in length respectively, the ends A and B being stopped at right angles with face of the wall. Draw the block plan as in Fig. 85. Draw on the facings, the external facings being those shown at A on the bonding diagram in Fig. 84, and the internal facings in this case being those shown at B, and carry the queen-closers through the entire thickness of the wall (see shaded portion, Fig. 85).